Structural steel units develop up to 7000 lbs. 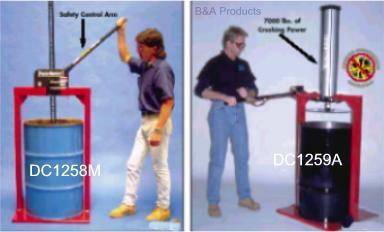 of compacting power. 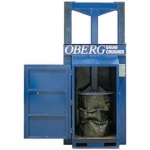 Crush paper, filters, aluminum cans, absorbents, disposable clothing. 1/4" thick ram plate. 18 month limited warranty. 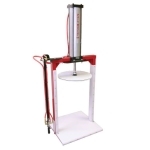 Manual Packmaster is simple and safe to use. 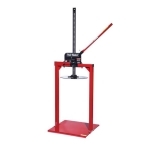 Slide an open-head drum (up to 39" high) onto the base and pump the ram lever like an automobile jack. Air Packmaster offers higher speed operation. Connects to any compressed air source (70-250 psi). Safety-designed control arm keeps operators hands and face away from compactor, stops cycle if arm is lowered or dropped. Completely cycles in 1 minute. Requires 8 CFM @ 100 psi to develop 2600 lbs. of compaction force. Develops 7000 lbs. of compaction force at 250 psi. 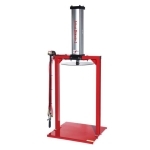 Spark Resistant Packmaster has high density polyethylene covered ram plate and drum skid area, low density polyethylene covered frame uprights and nylon pivot point bushing.